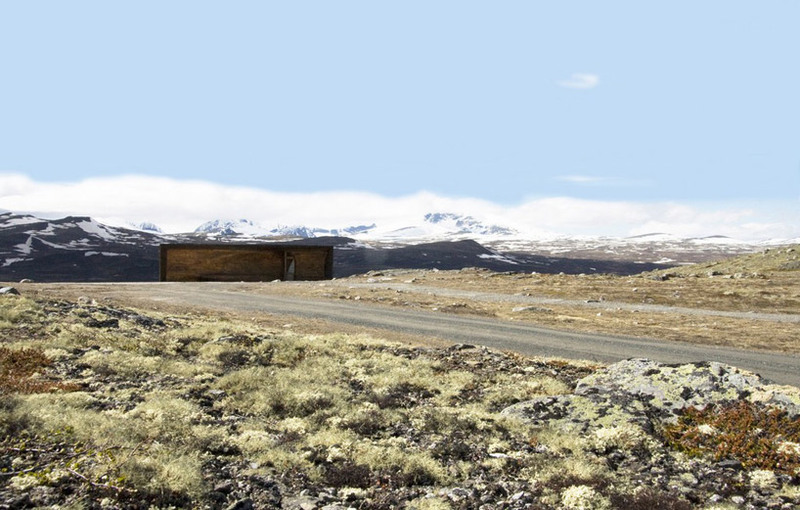 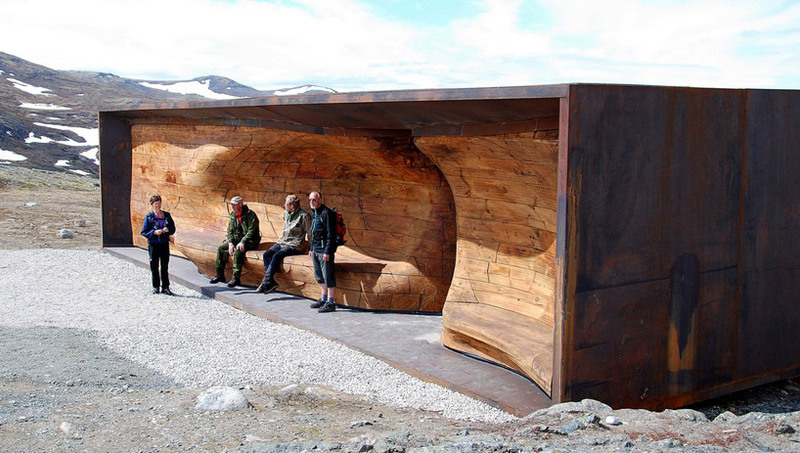 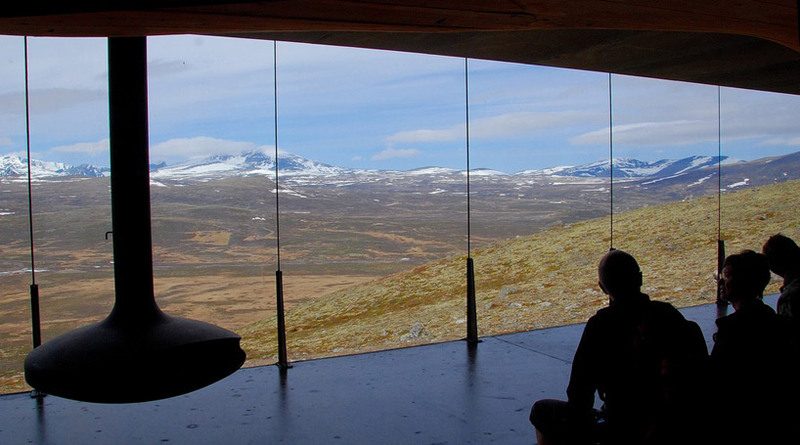 pavilion is positioned within the dovrefjell-sunndalsfjella national park, the remaining home to wild reindeer herds. 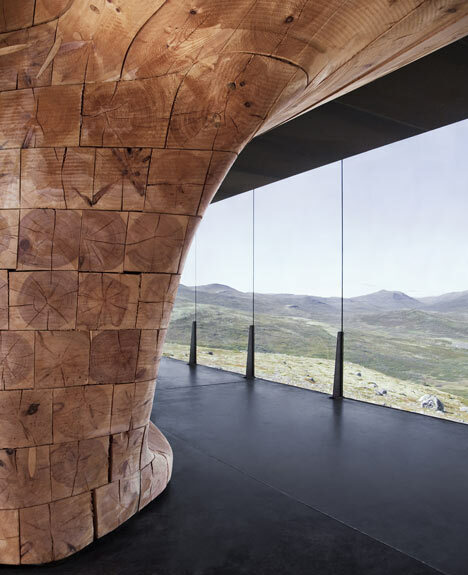 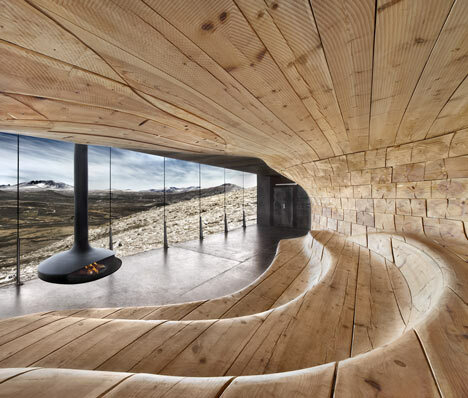 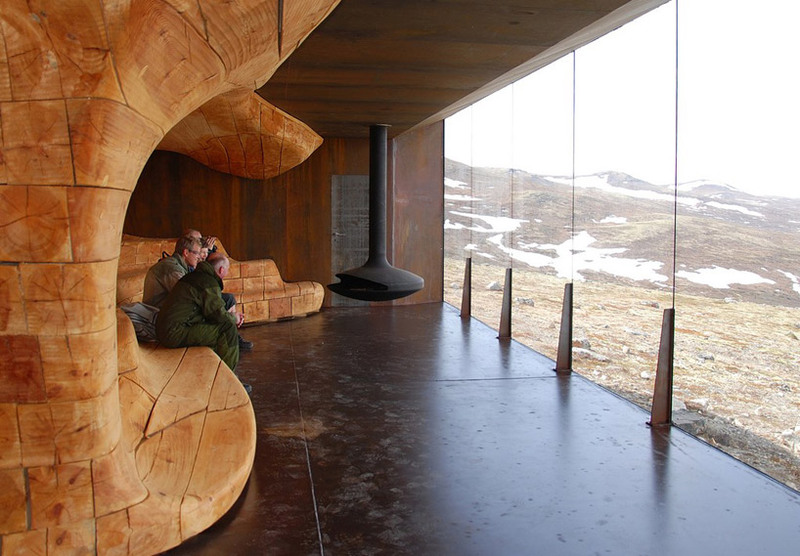 Perched upon a plateau at an elevation of 1200 meters above sea level, the structure provides transient visitors with panoramic vistas of the prominent snøhetta mountain range.reminiscent of rock forms slowly eroded by wind and water processes, the undulating southern facade creates outdoor seating warmed by the sun’s rays. 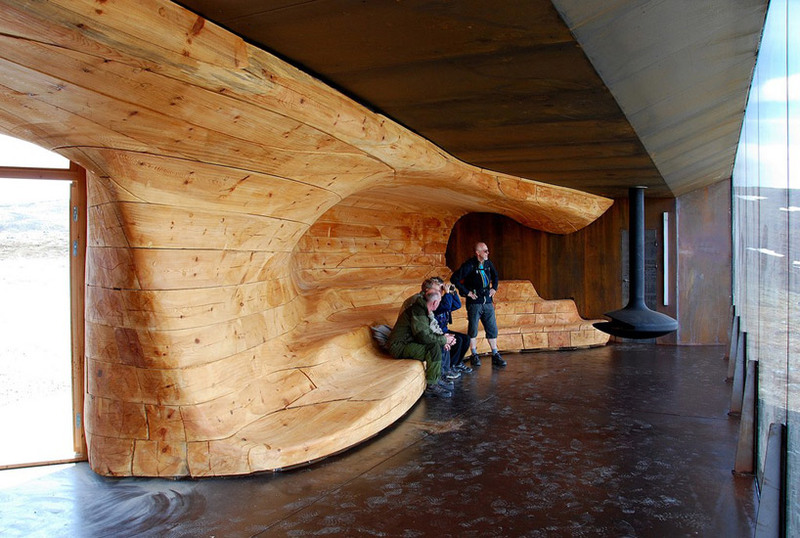 constructed with norwegian shipbuilding techniques in conjunction with advanced fabrication processes and machines, individual 10 inch square wooden beams were milled and assembled with pegs to produce the waving effect. 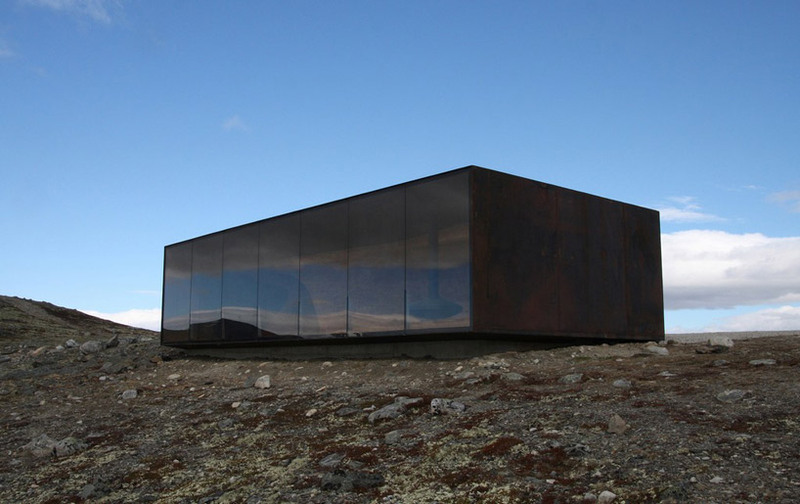 A rigid rectangular frame clad with rusted steel blends into the surrounding landscape while the saturated pine tar treatment of the exterior planks announces its presence to mountain hikers. 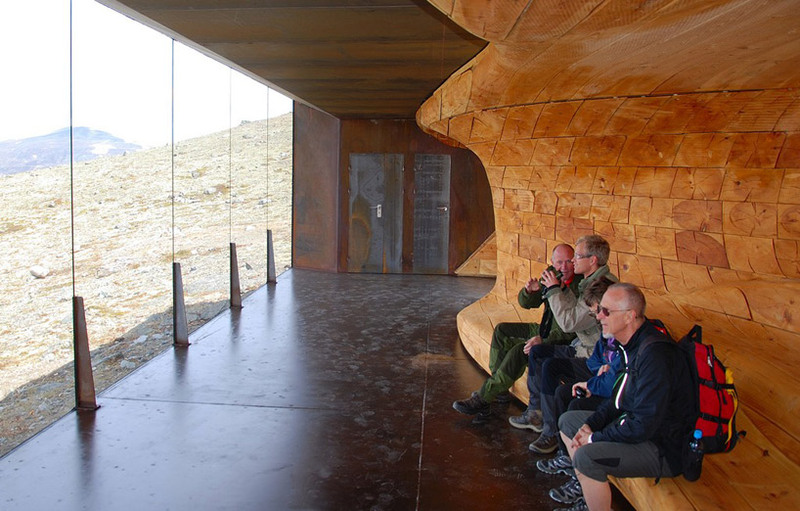 The interior wall of the gathering space provides additional benches with unobstructed views of the reserve through a floor to ceiling glass enclosure. 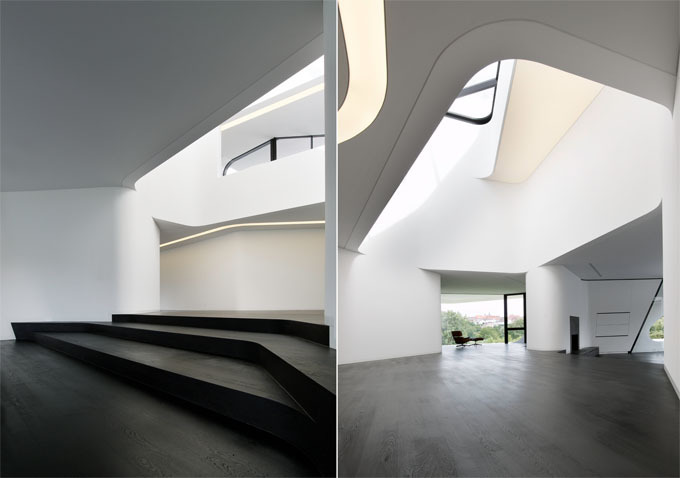 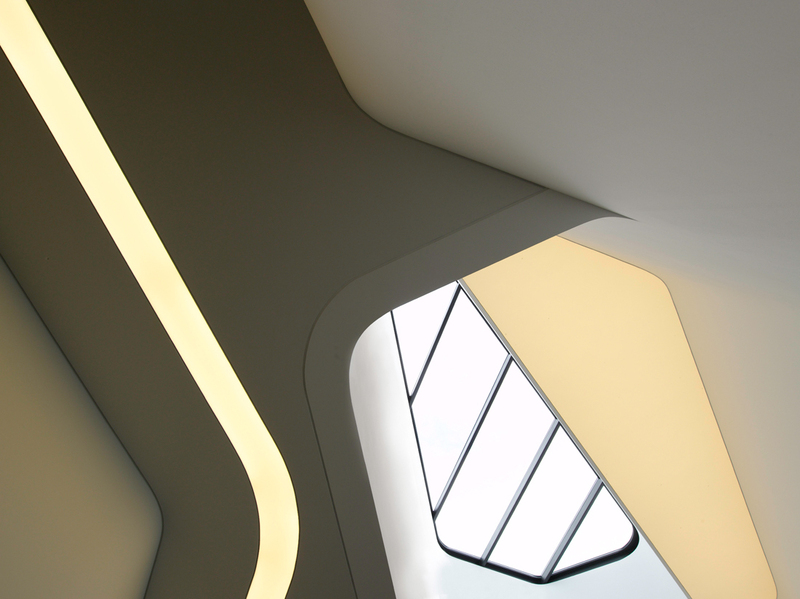 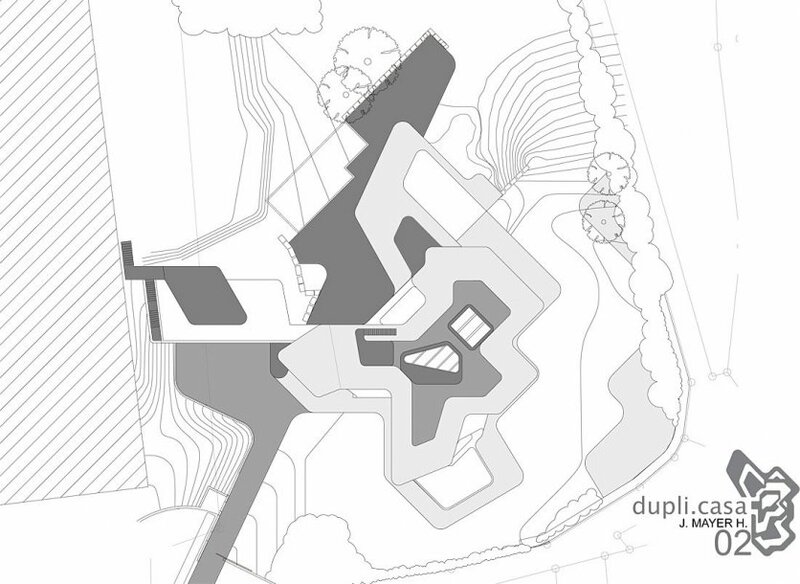 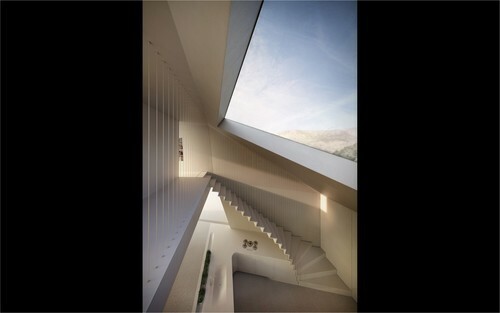 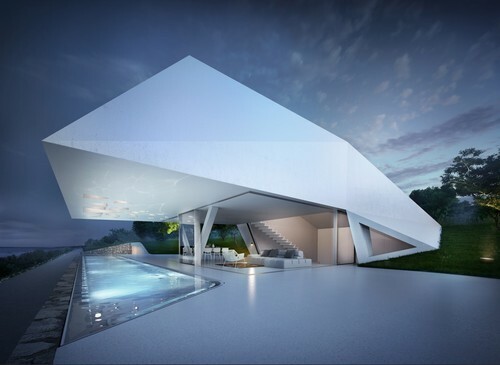 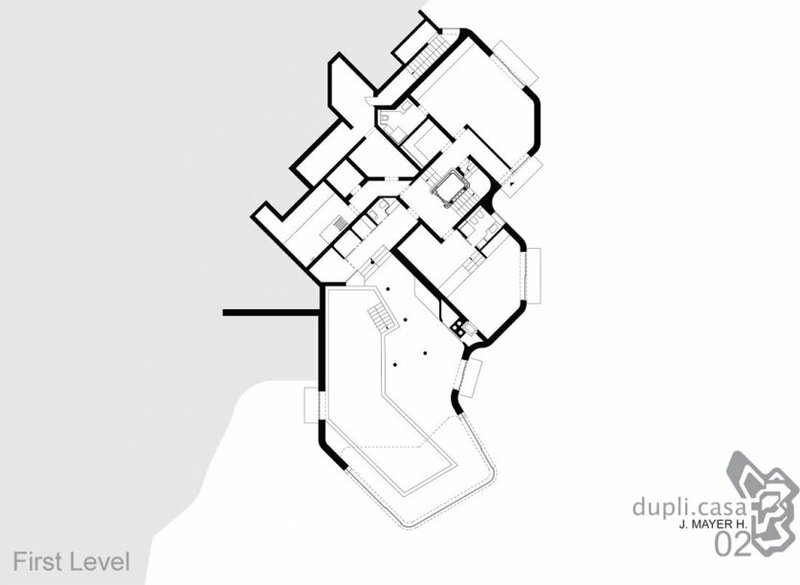 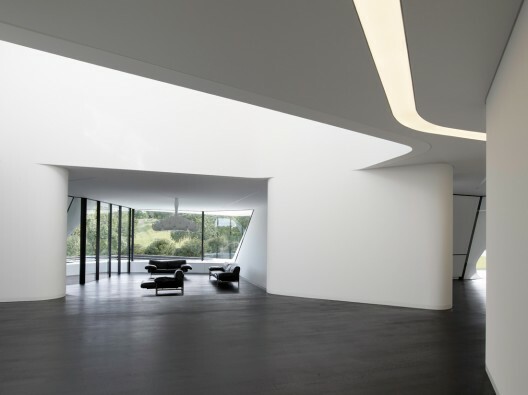 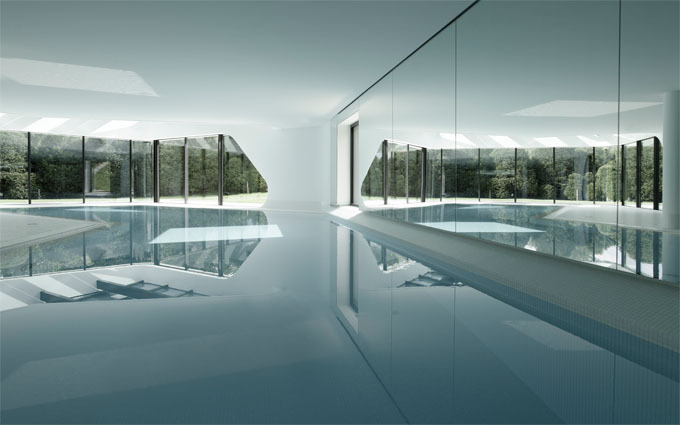 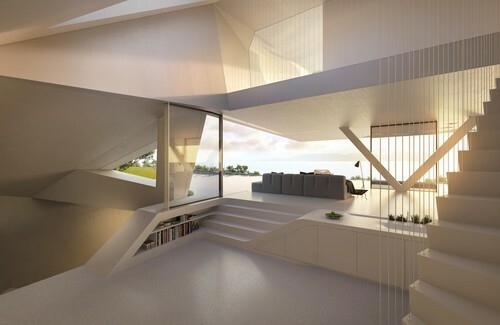 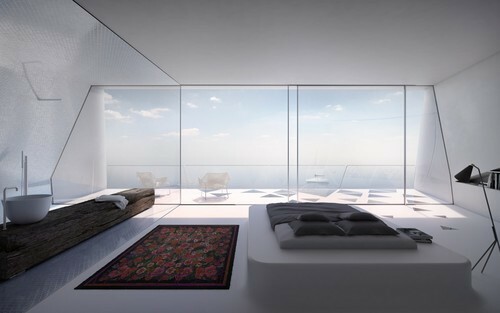 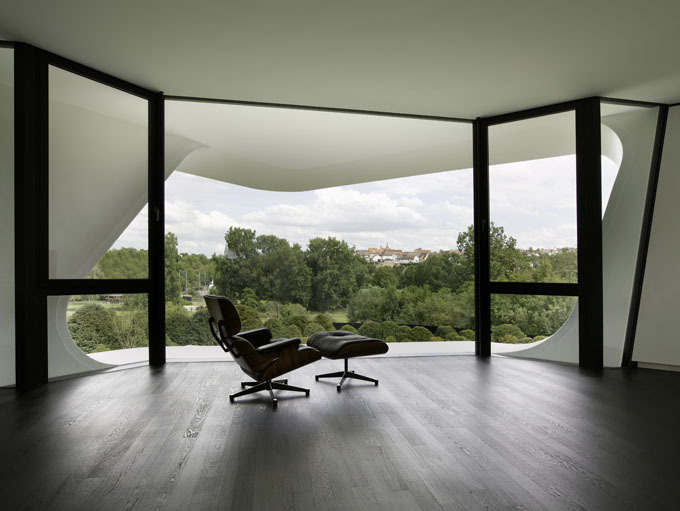 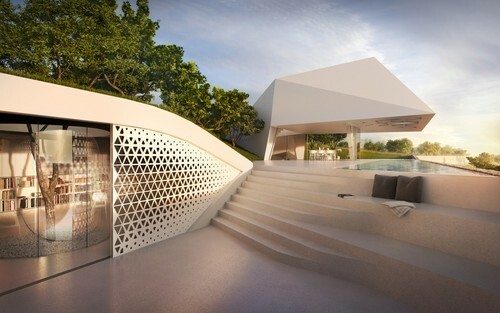 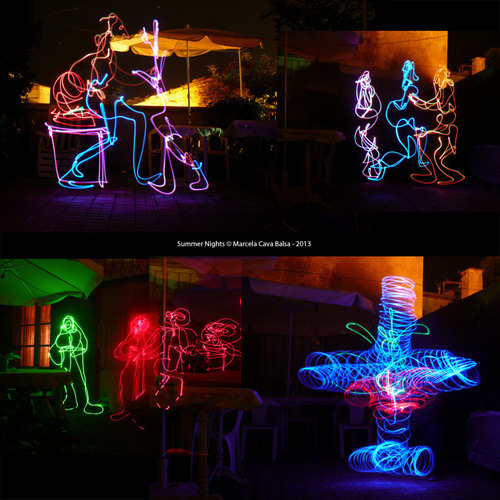 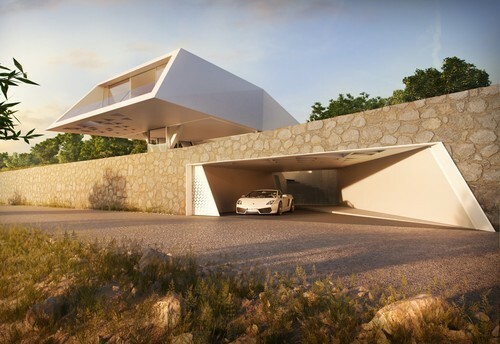 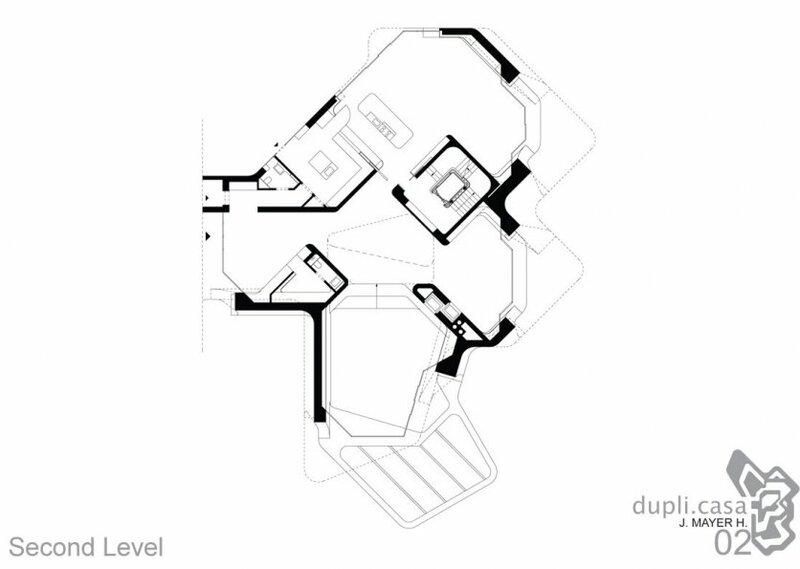 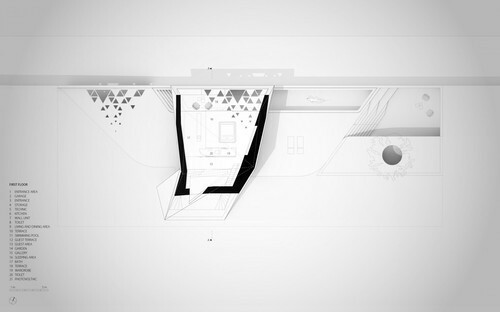 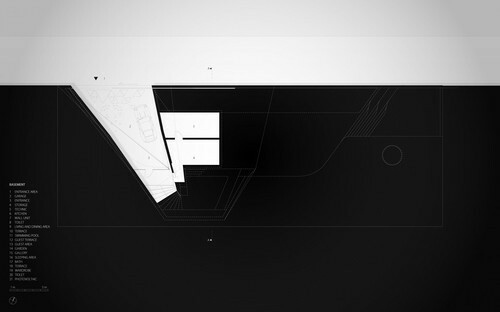 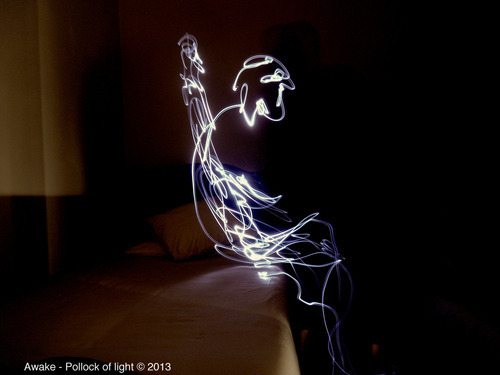 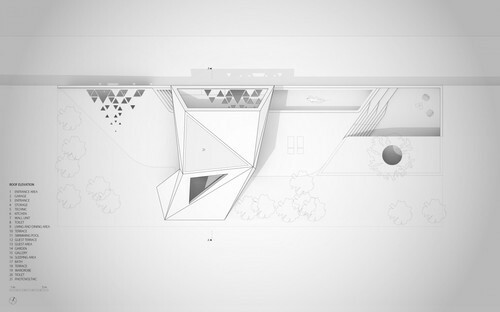 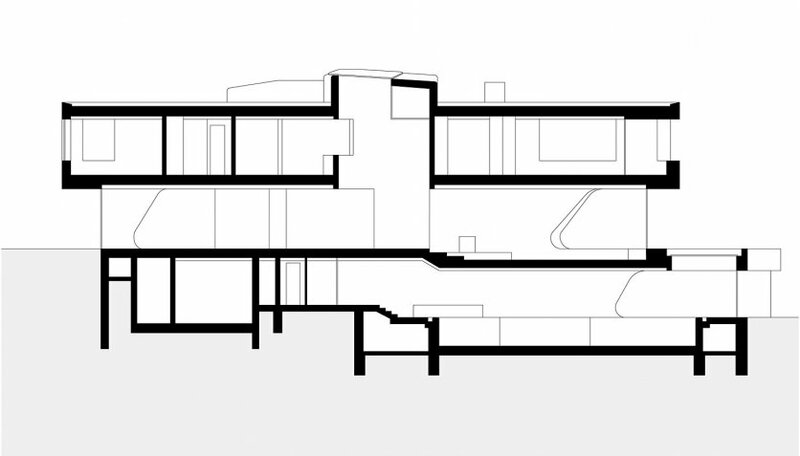 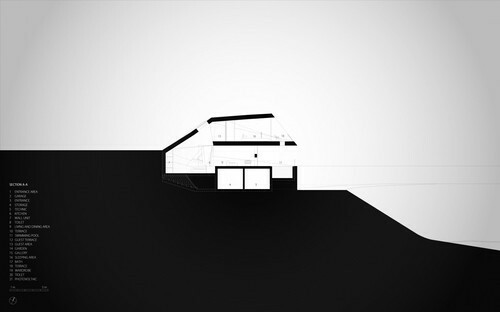 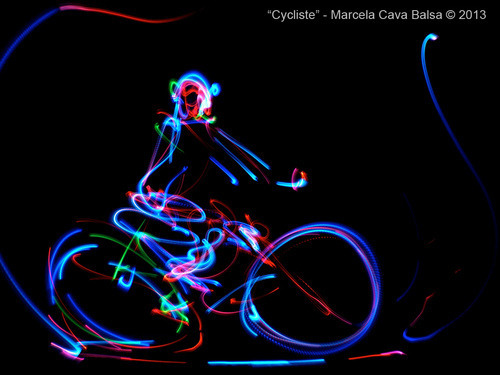 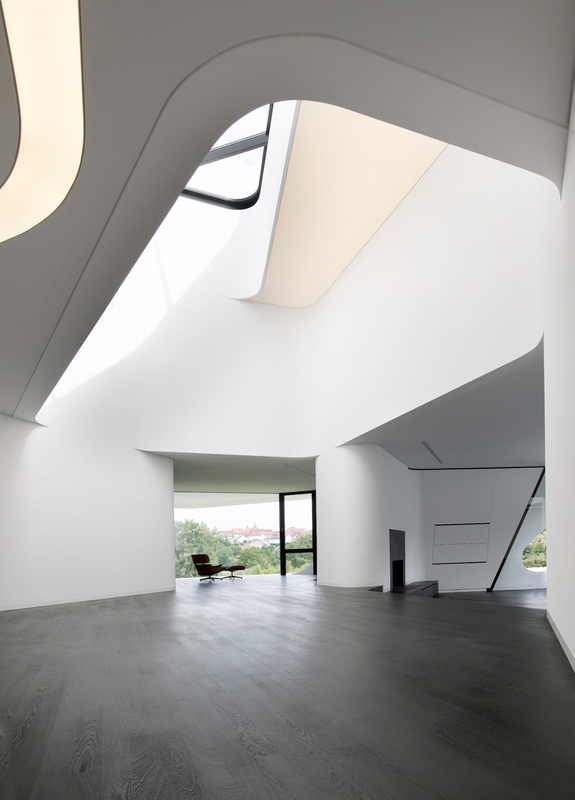 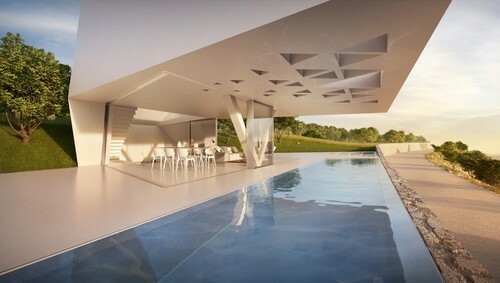 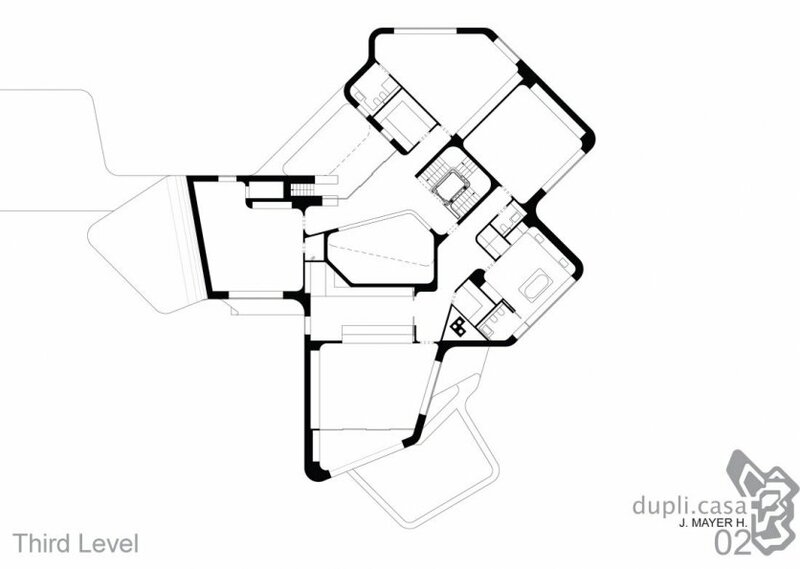 DUPLI CASA – Villa near Ludwigsburg, Germany _J. 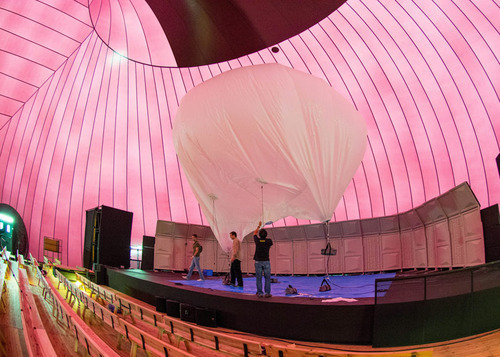 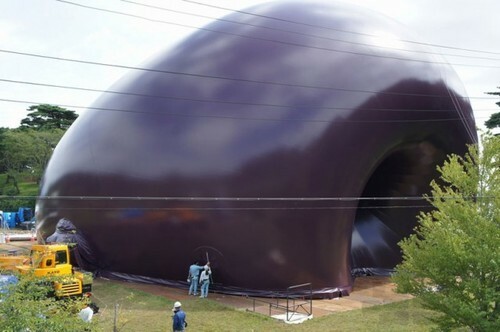 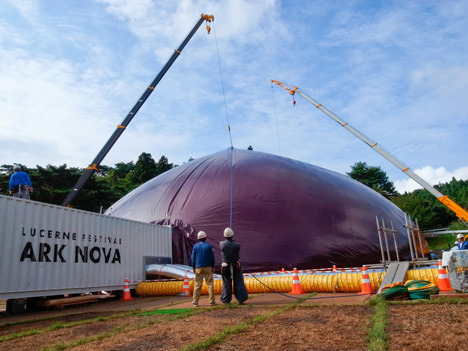 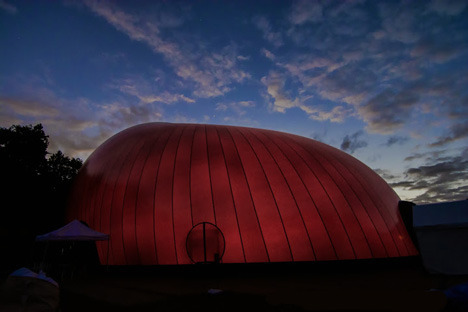 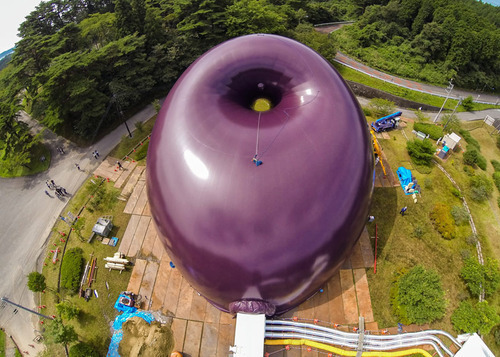 MAYER H.
It is an air-inflated membrane structure which equipped with the necessary stage and sound equipment. 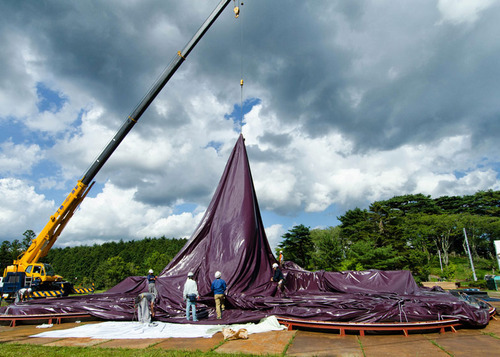 The membrane can be folded up and the equipment dismantled and loaded on a truck, so they can be brought to each site. 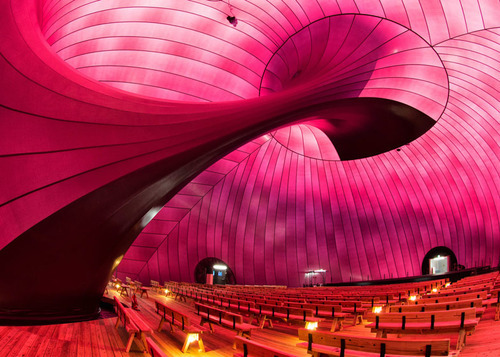 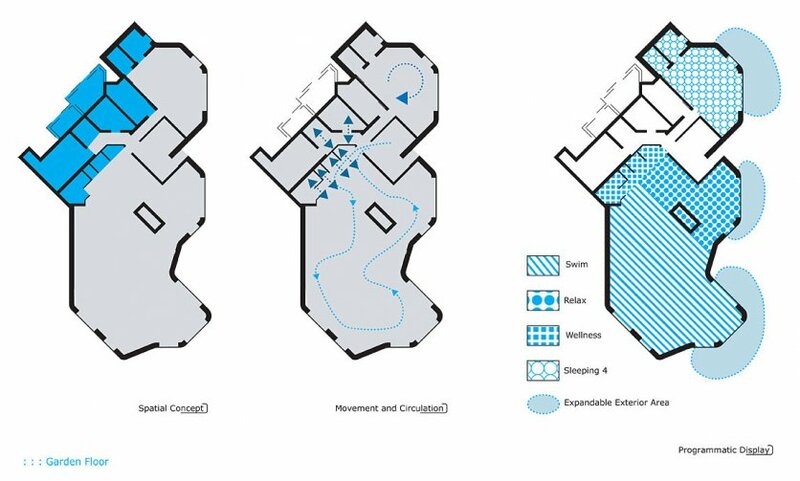 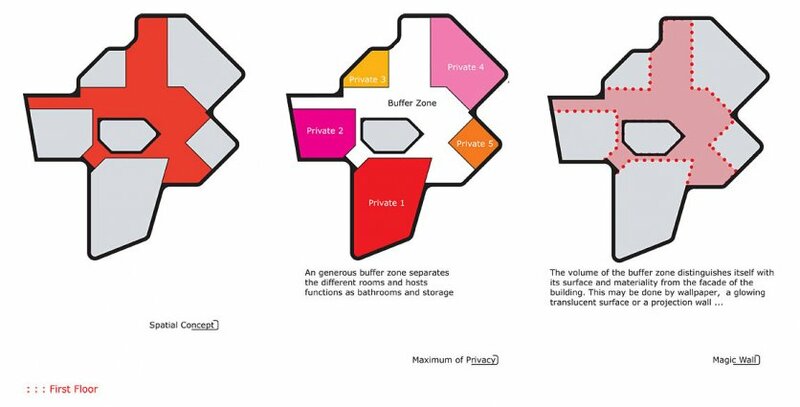 The interior is a single uninterrupted space which, depending on the arrangement of equipment, is a multistage format which can accommodate various events from orchestras to chamber music, jazz, the performing arts or exhibitions. 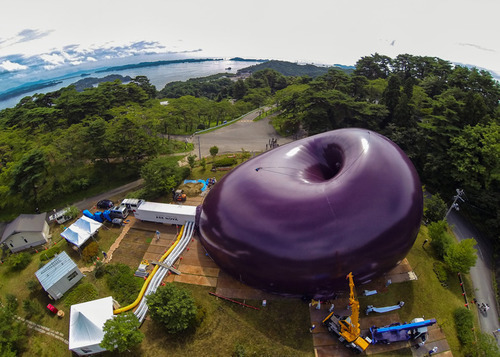 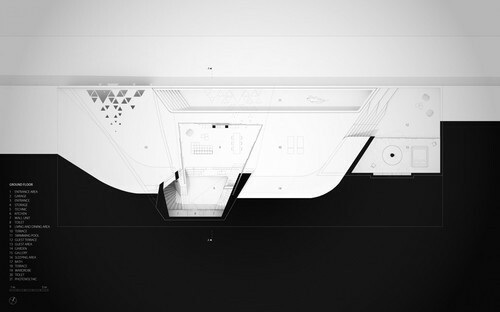 It is envisioned to seat 500 during an orchestra performance, and is planned to have a width of 30m, length of 36m and maximum height of 18m. 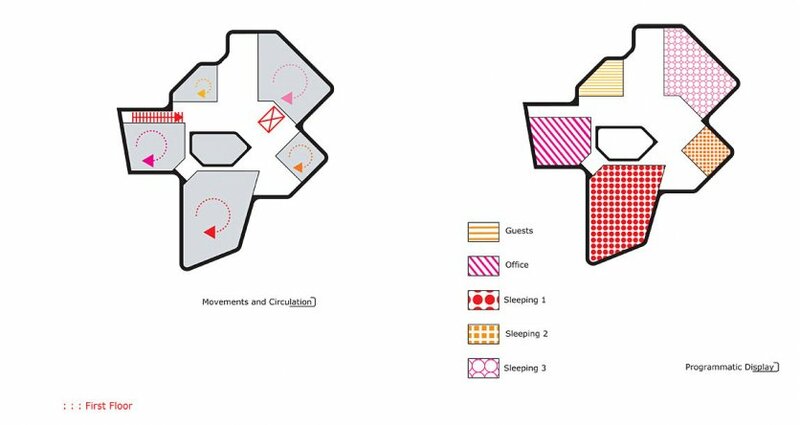 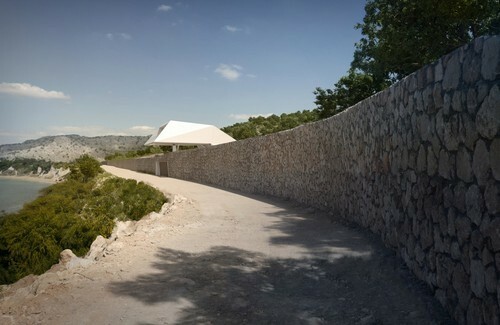 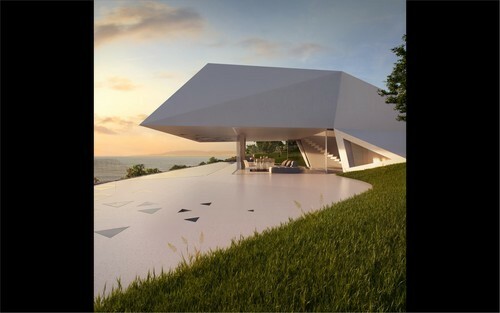 “The site of the holiday home in Rhodes/Greece yet possess characteristics and outstanding qualities, which we only attempted to frame with our design.